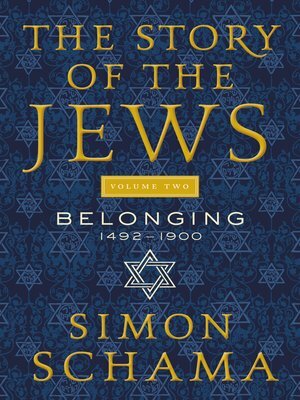 In the second of two volumes of this magnificently illustrated cultural history—the tie-in to the PBS and BBC series The Story of the Jews—Simon Schama details the story of the Jewish people, spanning from their expulsion from Spain during the Inquisition across six hundred years to the present day. It is a story like no other: an epic of endurance against destruction, of creativity in the face of oppression, joy amidst grief, the affirmation of life against the steepest of odds. It spans the centuries and the continents—from the Iberian Peninsula and the collapse of "the golden age" to the shtetls of Russia to the dusty streets of infant Hollywood. Its voices ring loud and clear, from the philosophical musings of Spinoza to the poetry written on slips of paper in concentration camps. Within these pages, the Enlightenment unfolds, a great diaspora transforms a country, a Viennese psychiatrist forever changes the conception of the human mind. And a great story unfolds. Not—as often imagined—of a people apart, but of a Jewish culture immersed in and imprinted by the peoples among whom they have dwelled. Which, as Simon Schama so brilliantly demonstrates, makes the story of the Jews everyone's story, too. The Story of the Jews Volume 2 features 24 pages of color photos, numerous maps, and printed endpapers.